Wood extracted from trees needs to be processed in some manner to make it useful as a building material, and a large industry in North America is devoted to the manufacture of wood products. 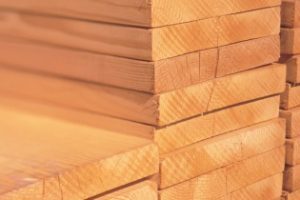 Lumber is sawn into desired shapes and sizes, dried in kilns to achieve dimensional stability and then planed to the desired dimensions and surface finish. Plywood and composite panels are manufactured by peeling, slicing, or chipping wood to create a raw material, pressing and gluing these raw materials into panels, engineered wood shapes, and other wood products, and setting the glue with the application of heat. Particleboard and fiberboard panels can also be made from sawdust, planer shavings, and board trim from lumber operations. Although impacted by the recent downturn in housing starts in the United States, the wood products manufacturing industry is a large and important industrial sector in North America. In the United States, manufacturing of wood products is a $67 billion industry. In Canada, wood product manufacturing employs more than 100,000 individuals and accounts for nearly $8 billion in exports, mostly to the United States. In the modern era, wood products manufacturing utilizes sophisticated, efficient and highly automated processes to ensure that the best features of a given wood resource are used to best advantage to create the optimal product with minimal wastage. Residuals from the manufacturing process, such as bark, sawdust, planer shavings, sander dust, and trim are either returned to the process, used as fuel to dry wood or produce steam, or are made into other products such as landscaping mulch or animal bedding. While panel and engineered lumber manufacturing facilities employ modern pollution control equipment and modified resin formulations to minimize atmospheric emissions, some emissions are released from wood drying equipment, from steam-generating boilers, and from other manufacturing processes. Most wood processing plants require little, if any, water during manufacturing, and thus they discharge little, or no, effluent to surface waters. Manufacturing residuals are typically used to generate by-products or are burned as fuels, so wood products facilities typically send minimal amounts of solid waste to landfills. As with other forest products manufacturing, the wood products industry is highly regulated in both the United States and Canada, and operates in compliance with a myriad of regulations, permit requirements, work practice standards and other guidance. The industry’s customers expect wood products to be manufactured in a sustainable, socially responsible manner. These incentives reinforce the commitment of wood products companies to excellence in environmental performance, sustainability in manufacturing operations and responsible utilization of the wood resource. In North America, the wood products industry voluntarily supports the National Council for Air and Stream Improvement as a technical resource, whose mission is to analyze, understand and communicate the technical aspects of issues associated with wood product manufacturing operations. Results of NCASI’s investigations are shared with sponsoring companies, regulatory agencies, trade associations, environmental organizations, community groups and other stakeholders. The availability of such information can lead to more reasoned and technically sound decision-making, to the collective benefit of society at large. NCASI’s goal in these endeavors is to develop and communicate science-based understanding that is of the highest technical quality, transparent to appropriate stakeholders, and recognized as adhering to the highest standards of the scientific community.